Soccer Xplorer is based in Crystal Lake, Illinois, where we provide individual and group soccer training. Our unique soccer drills improve every part of a player's game, and are specifically designed to appeal to young adults and children who play soccer. Ask about playing futsal, or attending our soccer camps as well. Our training is perfect for soccer players from age eight through high school seniors. The areas covered will include technical skills and physical conditioning, as well as a tactical understanding of the game and mental preparation that many other coaching strategies omit. We are happy to meet you individually at a location of your choice, including spaces where we can work with full teams. Sessions typically range from one hour for individuals to two hours for teams or clubs. All of this training and conditioning is based on your unique needs, and the areas in which the player or team need to improve. Let our experts construct a curriculum-based training program tailored to a player's individual goals and needs, or sit in on a game to watch your team play. 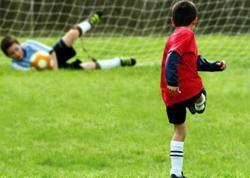 Our seasoned soccer coaches will quickly determine the areas where improvement is needed most. Contact us today, and learn more about how to take soccer skills to the next level. ©2019 Soccer Explorer / SportsEngine. All Rights Reserved.